We’re not exactly spoilt for choice when it comes to fish and chips in central Bristol. Sure, there are plenty of places SERVING fish and chips, but if you want a traditional chippy, you have to head to Clifton Village, Whiteladies Road, Bedminster or further afield. 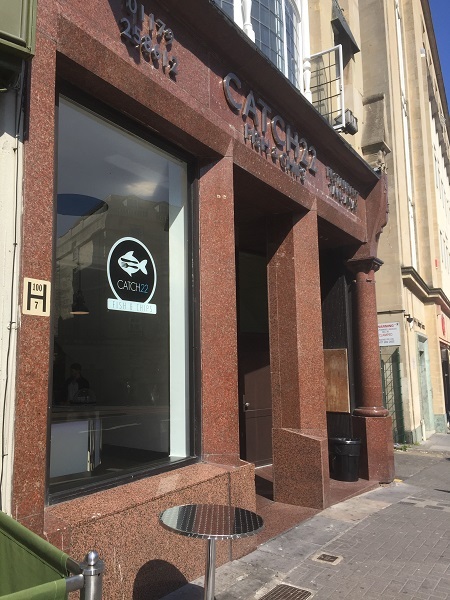 That’s all changed, though, with the opening of Catch22 on Park Street: a fish and chip shop that is traditional in some ways, and more innovative in others. Having opened at the start of April, Catch22 is already doing a roaring trade, both in the evenings and with the lunchtime crowd. We visited at 2.30pm to find a queue of people waiting for their orders, and passed a number of others with their distinctive blue and white cardboard boxes of food along Park Street on our way. Co-owned by Rocky, whose background is in the music industry, and Oddy, who comes from the food and drink industry, Catch22 is located at the bottom of Park Street, opposite the Marriott Hotel. Formerly used as the City Job Shop, the premises at 38 College Green dates back to the early 1900s, and while a more contemporary fish-themed mural now graces the side of the building, be sure to look up – the Art Nouveau-style fascia of the upper floors is truly outstanding. While the premises may look small from the outside, appearances can be deceptive: step in through the front doors and you’re faced with the main counter, a small bar area and a seated restaurant at the back, offering space for around 40 covers. When we arrived, Rocky was also setting up brand new tables and chairs on the pavement at the front of the restaurant, providing even more space in which diners could sit and soak up the rays while eating. The restaurant area was, at the time of writing, not officially open, but there were still customers sitting down and enjoying their meals. 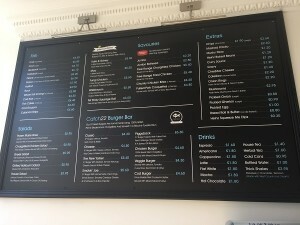 On the day of my visit, it was still all about the takeaway, with a large blackboard by the front of the restaurant advertising the fish, salads, homemade burgers, Pieminister pies, savouries, drinks and sides that were on offer to take away. All of the fish, I was told, is from sustainable sources, with plenty of tasting sessions before the restaurant opened to ensure that the team picked the best options available. I was pleased to see that the traditional chippie sides of mushy peas, pickled eggs, bread and butter and curry sauce, among others, were all available – and the prices are very reasonable too, especially given Catch22’s central location. I ate my cod and chips (£4.50) in the restaurant area, which was relatively dark but featured comfortable seating and fantastic Catch22 branded wooden tables. The food arrived pretty quickly after ordering, served in a sturdy cardboard box which offers easy transportation for takeaway orders without any mess. The fish itself was beautifully cooked, deep fried in sustainable palm oil and with a lovely crunch to the batter (but not too much! ), while the chips were full of flavour and without the sogginess that you come to expect from some chippies. A squeeze of lemon and lashings of salt and vinegar topped it off perfectly, and the portion was certainly generous for the price. When the restaurant area officially opens, things will be slightly different. It will coincide with the launch of a new restaurant menu – which will include starters, mains that include grilled fish, black cod and specials such as jerk cod, and also desserts. The licenced bar will serve up a range of beers and wines until 11pm, and there will also be table service to boot. Early reports from the Catch22 team suggest that the first few weeks have gone well, with both lunchtimes and evenings nice and busy. It’s no surprise, though: it’s great to see somewhere that’s opened that serves one of our iconic national dishes with such attention to detail and quality – and with big plans for the restaurant area on the horizon, it will be interesting to see how Catch22 develops. I agree – it can be really hard to find a good local chippy sometimes! I love the fact that they have the restaurant option coming soon too! Spent my first 6 months in central Bristol scratching my head trying to find a chippy, but no more :-). Only had soggy chips at Weston super mare, so looking forward to trying catch 22. I have tries Catch 22 several times now since they opened, and so have some of my colleagues too. We all have to agree that the food is great and is every time we eat from there. Oddy is amazing even remembering my name when I call to pre order our food. I cannot speak highly enough of Catch 22’s consistent quality of food and the Customer Service! Fish and chips were the best i have had in bristol, but the burgers are handmade from scratch and absolutely amazing! I had the Smokin’ Joe, and the onion ring were made in front of my eyes and the burgers patty was high quality and chunky loveliness. The brioche bun adds to the taste too. Staf were really friendly and I only went in for a lunch! Top drawer guys, as a famous Austrian once said, “i’ll be back”! 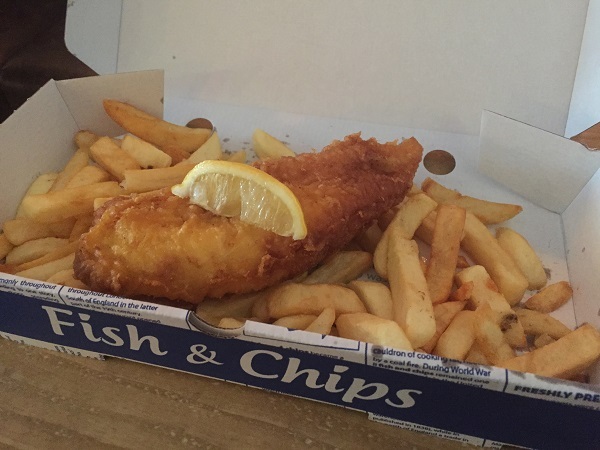 Great friendly service ordered 3 Regular Cod and chips on the 12/06/15. £19.40 all cooked to order ,but and it a big but £19.40 for 3 small fish and chips £6.40 each, feel bit ripped off wont be back pity had high hopes. It was OK tasted good just mean in size for the price. COD £4.50 REGULAR AND CHIPS REGULAR £1.90. I have had better but good luck to them all the best,but i will not be back because it was mean for what it was.